The prime minister has raised the cases of the dual nationals being held in Iran with the country's president. 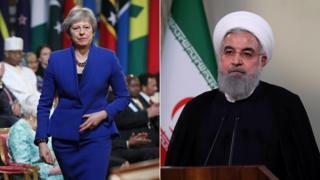 In a telephone call, Theresa May urged Hassan Rouhani to make further progress over the release of British-Iranians "on humanitarian grounds". Mrs May also reiterated the UK's commitment to the Iran nuclear deal, which the US pulled out of last week. Downing Street said both leaders agreed to keep in contact about both topics ahead of a Brussels meeting on Tuesday. There are nearly 30 dual nationals being held by the Iranian authorities - many of whom are accused of security offences. Last month, London's Imperial College professor Abbas Edalat was detained while reportedly attending an academic workshop in Tehran. Another case is that of Nazanin Zaghari Ratcliffe, who is currently serving a five-year prison sentence, after being convicted of spying charges. She has always denied the claims. Mrs Zaghari-Ratcliffe was arrested in 2016 during a holiday to introduce her baby daughter Gabriella to her parents. Meanwhile, Mrs May also used the phone call to bolster the European support for the Iran nuclear deal - designed to prevent the country developing atomic weapons. US President Donald Trump withdrew from the deal, which was one of his election pledges, but the UK, Germany and France remain "firmly committed" to upholding it. A Downing Street spokesman said: "[Mrs May said] it is in both the UK and Iran's national security interests to maintain the deal and welcomed president Rouhani's public commitment to abide by its terms, adding that it is essential that Iran continues to meet its obligations. "The prime minister made clear that the UK condemns the Iranian missile attacks against Israeli forces and called on Iran to refrain from any further attacks. "She said it was important to avoid provocative actions to ensure peace and security in the region."